An innovative new technology used for the first time in the 2018 Dodge Challenger SRT Demon has won the 2017 Popular Science Best of What's New Award. The magazine hands out these awards annually and covers the top one hundred tech innovations in eleven different categories. So what exactly is a Power Chiller? It's a technology that uses the car's air conditioning refrigerant to help further cool the air entering the supercharged Demon V-8's cylinders. Cooler air has more oxygen molecules, and this, in turn, helps the engine put out its whopping 840 horsepower with 100+ high-octane unleaded fuel. To decide who should win the top tech innovations of the year Popular Science searches for what they can find as the most breakthrough product in each of the awards categories. While the Power Chiller won in the automotive category, other categories the magazine selects winners for include Aerospace, Engineering, Entertainment, Gadgets, Security, Health and Recreation. So How Exactly does the Power Chiller work? The Demon's 6.2-liter HEMI V-8 uses a dedicated liquid circuit, separate from the engine cooling circuit, to cool air after it leaves the 2.7-liter supercharger. The SRT Power Chiller is enabled when Drag Mode is selected from the SRT's Drive Mode selections. Once it is activated, conditioning refrigerant is diverted from the cabin to the chiller unit. The supercharger charge air coolant passes through a low-temperature radiator then flows through the SRT Power Chiller unit, where it is further cooled by the refrigerant. That chilled liquid then goes through heat exchanger units in the supercharger housing, cooling compressed air as it enters the intake ports. So what is the point of all this? Cooler air is denser and contains more oxygen molecules per volume than warm air. With more oxygen entering the engine, adding more fuel produces more power. The SRT Demon is a record-setting 840-horsepower vehicle. The Power Chiller is just one of many innovations that have allowed Dodge to produce such a car. Among the 2018 Dodge Challenger SRT Demon achievements are the title of the world's fastest quarter-mile car and first-ever production car to lift the front wheels at launch. 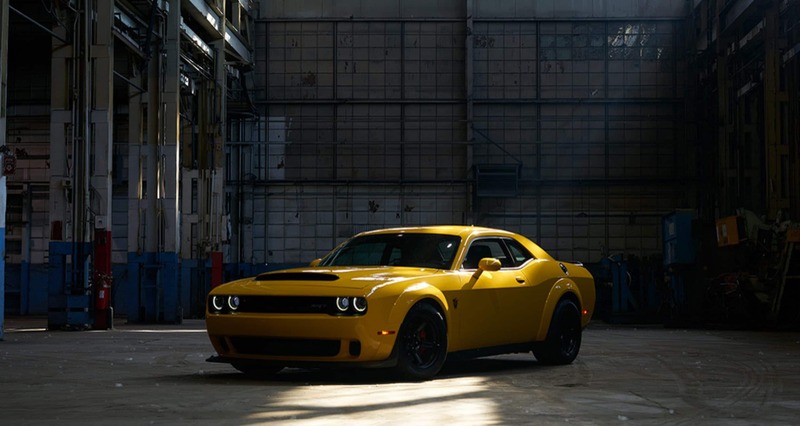 Other technologies used in the Demon is the Air-Grabber induction system that includes the largest functional hood scoop of any production car. The Demon is also the first-ever, factory-production car with TransBrake, for more powerful and quicker launches, and Torque Reserve, to deliver increased levels of power and torque at launch.